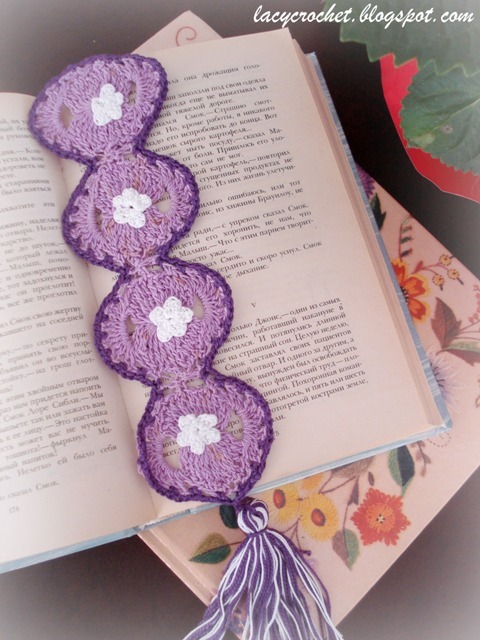 A few weeks ago, I posted about a fan bookmark that I crocheted for a bookmark exchange. The other day, a crocheted bookmark arrived to my mailbox too! My bookmark exchange partner Ally sent me this charming lilac bookmark. I love the tiny white flowers on it! To fully enjoy my new beautiful bookmark, I put it in the book I’m reading right now (which is Smoke Bellew by Jack London). Big thanks to Ally for this lovely gift! My mom made this lovely small doily for me a few years ago. 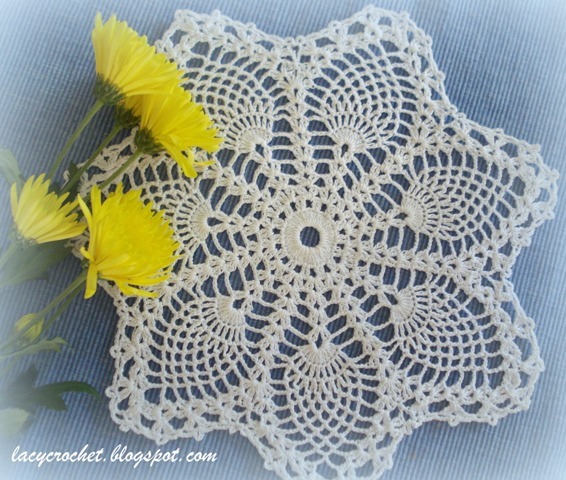 In fact, it was one of the first doilies in my now vast collection. 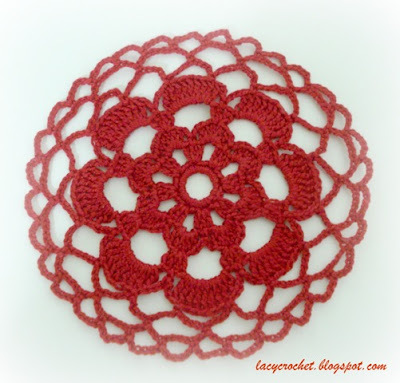 I’ve seen this same doily on other crocheting blogs and sites. For instance, Sarah at Sarah Sweethearts crocheted this doily a few weeks ago. So I searched the web in hope of finding the pattern. And I was lucky! 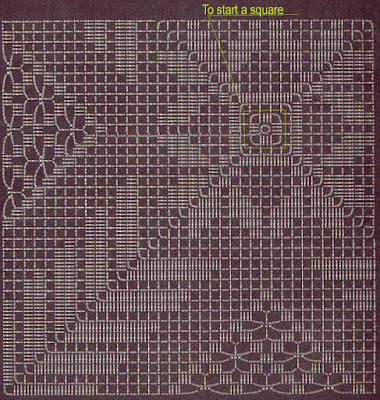 I believe this is the pattern for the same doily. Perhaps someone will want to try it too. Spring has definitely arrived to my town! Many trees are in bloom, and daffodils, narcissuses, cyclamens, and hyacinths stick out here and there around the neighborhood. I am in a spring mood too (and I even started my spring cleaning), so I picked this pink doily to share today. 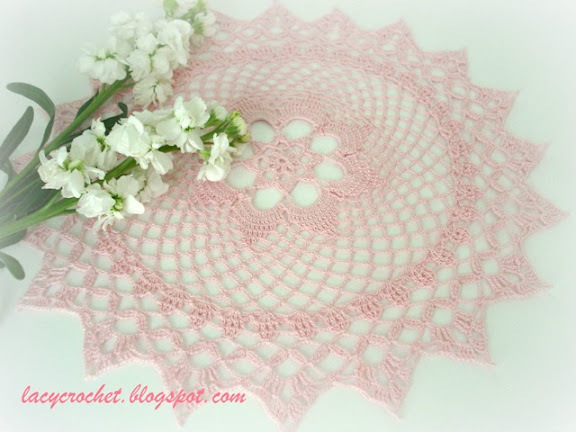 I associate this doily with spring because its pale pink color reminds me of pink tulips and pink hyacinths. I crocheted this doily last year. I remember that the pattern was from a Russian crochet magazine, but I don’t remember its name. 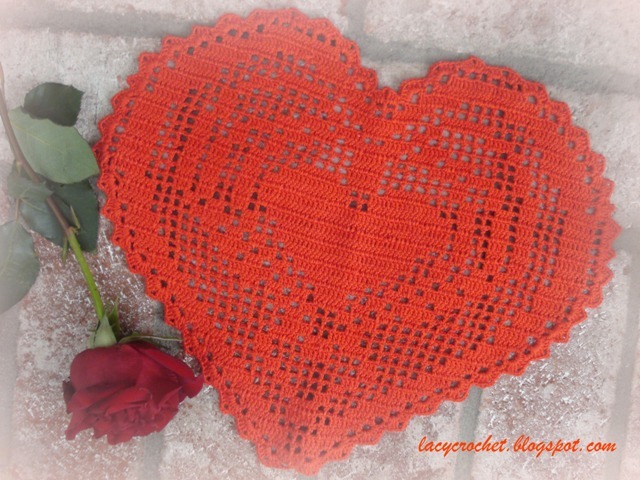 This past week I wasn’t at my best health (how sad to be unwell on Valentine’s Day), so I didn’t do any crocheting. But I always have some pretty crochet work to share! 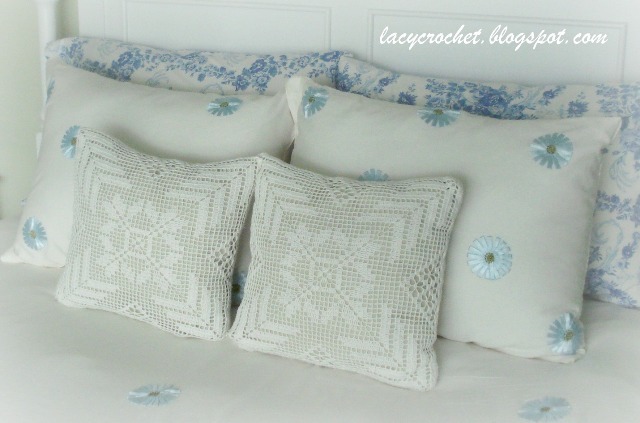 These two pillows with lacy covers were made by my mom a couple years ago. I think they look quite lovely on my bed! 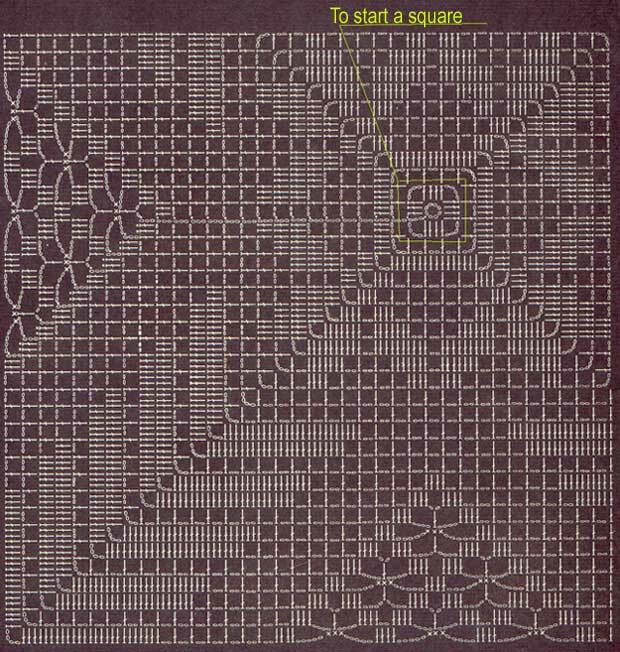 She used a symbol chart pattern from a vintage Russian magazine (it was actually still a Soviet magazine). The original pattern was for a blouse made of motifs, but my mom adjusted the pattern (she is quite clever with things like that) for pillow covers. This is my last Valentine’s Day project for this year. After finishing this mini doily a few days ago, I put away my red crochet thread. 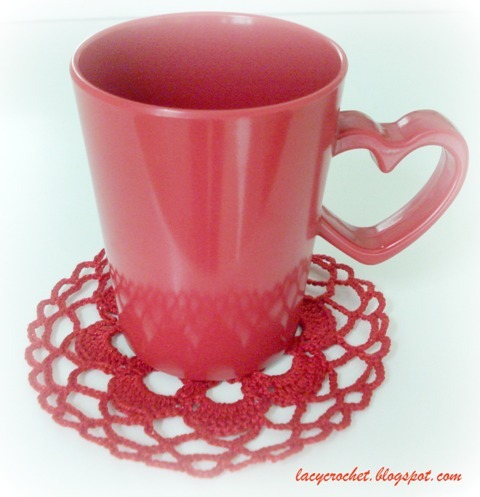 I planned to make several of these coasters, but the truth is I am getting bored of crocheting with red. I designed the pattern myself. I am working on a symbol chart for it and hope to share it here soon. With Valentine’s Day less than two weeks away, it’s all about red hearts now. I received this heart doily as a present from my mother-in-law a few years ago. Very pretty, isn’t it? A friend of mine is expecting a baby girl in February! This blanket is my present to her. No, I didn’t make it myself (though I’d love to, but for now I am sticking with small projects). I commissioned the blanket to my mom. I think she did a magnificent job! 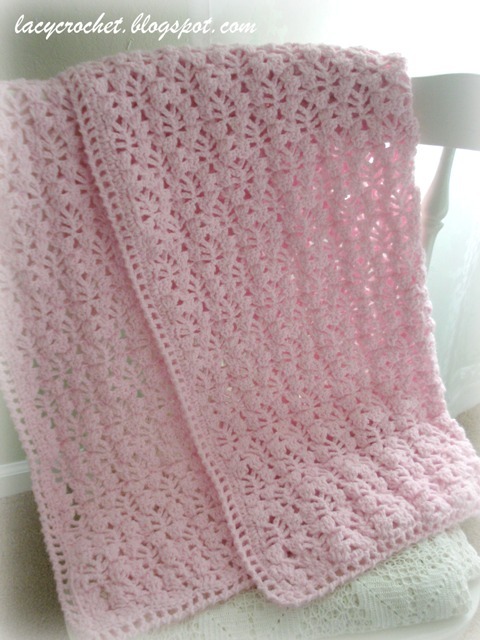 She used Pale Pink Pound of Love yarn by Lion Brand. One ball of yarn was enough for one blanket. She didn’t follow any particular blanket patterns, but she found the stitch pattern in one of her vintage crochet books. 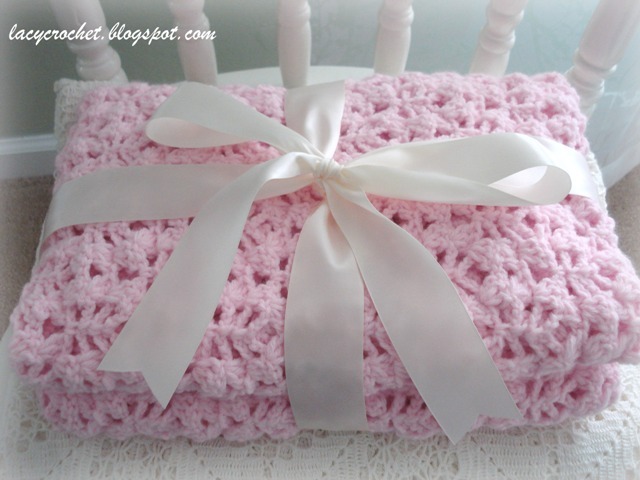 I can’t wait to see my friend and present her with this lovely blanket for her little princess! Update: The pattern for the main stitch for this blanket is now available. Click here to see it.